On June 29th, 2012, representatives from the Research and Innovative Transportation Administration (RITA) - Dr. Kevin Womack, Associate Administrator for Research, Development and Technology, Denise Dunn, our grant administrator for the new award, and Lydia Mercado, our grant administrator for the award under SAFETEA-LU visited UTRC at the campus of the City College of New York. Transportation Engineering and Associate Head of the Department of Civil and Structural Engineering at the Hong Kong Polytechnic University will deliver a presentation on “Intelligent Transport Systems in Hong Kong”. Prof.
Dr. Clifford Winston presented a Visiting Scholar Seminar on April 13th on the topic, “Performance and Policy Reform of the U.S. Transportation System”. The seminar was very well attended by transportation experts in academia and private & public sectors. Dr. Winston is a senior fellow in the Brookings Institution’s Economic Studies program, has been with Brookings since 1984. UTRC and NYSDOT, among others, are co-sponsoring “SMT2012 Conference: NDT/NDE for Highways and Bridges: Structural Materials Technology” and invite abstracts for presentation at the conference. This conference will be held in the New York LaGuardia Airport Marriott near New York City, NY on August 21-24, 2012. Dr. Rachel Weinberger Authored a Paper in the journal of Environment and Planning titled: “Separating Contextual from Endogenous Effects in Automobile Ownership Models”. UTRC's Project "On The Go Travel Station Kiosk" Selected as an "ITS-NY 2012 Project of the Year"
The Intelligent Transportation Society of New York (ITS-NY) announced the 2012 ITS-NY Project of the Year Winners at its Nineteenth Annual Meeting and Technology Exhibition held on June 7-8, 2012 in Saratoga Springs, NY. 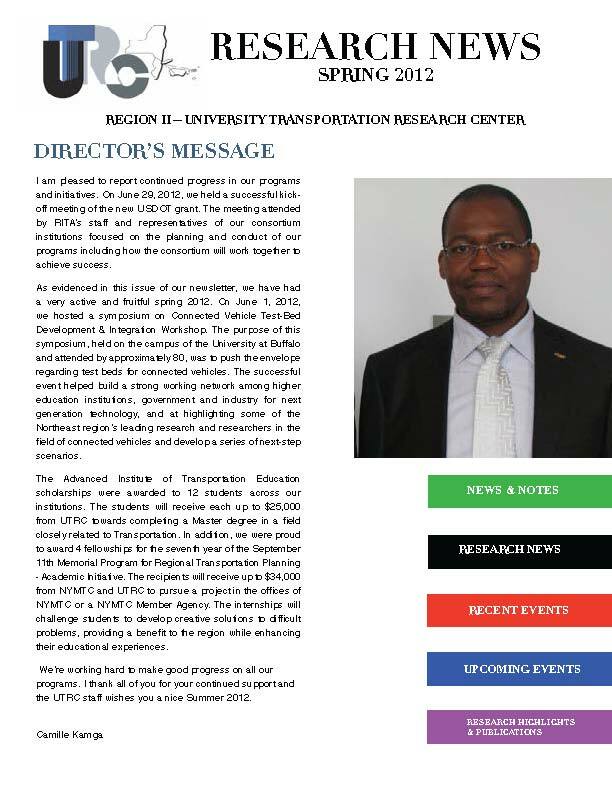 “These winning projects feature Intelligent Transportation Systems (ITS) and technologies at work in New York State to improve traveler mobility and safety, as well as the efficiency of New York State’s transportation system across all modes of travel,” said Dr. In April, UTRC welcomed seven master’s degree-level students with specialties in sustainable transportation and civil engineering from the Ecole Nationale des Travaux Publics de l’Etat (ENTPE) in Lyon, France, which is a highly competitive engineering school in France. The students are all participants in a national civil service program which requires that they complete a 20-week internship either in France or abroad. Professor Mitchell L. Moss is the Director of the Rudin Center for Transportation and Henry Hart Rice Professor Urban Policy and Planning at New York University’s Wagner Graduate School of Public Service.